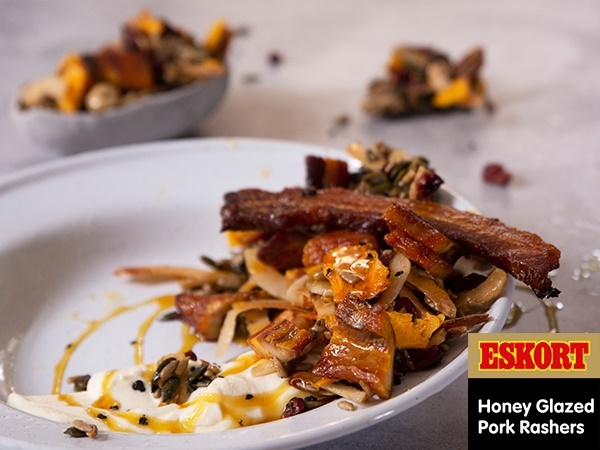 Nut, seed and dried fruit trail mix is elevated by the addition of #JustDelicious Honey Glazed Rasher bits and a rich, buttery-sweet glaze that’ll make your mouth water! Combine all the ingredients in a saucepan over moderate heat. Stir until well combined and bring to the boil. Boil for three minutes then remove from the heat. Fry the rashers in a pan until golden and crispy. Cut into small pieces and keep aside. In a large bowl, combine the rest of the trail mix ingredients. Add the rasher pieces and mix through. Add the mixture to a large baking sheet, pour over the glaze and mix well. Bake the trail mix for 35 minutes then remove from the oven. Let the mixture cool before breaking it apart. Enjoy as an on-the-go snack or as a topping for salad, yoghurt or porridge.